Radio Electronic Token Block (RETB) is the signalling system in use on the West Highland Line, the Kyle Line and the Far North Line. Elsewhere, RETB was introduced on the East Suffolk line in 1985, and the Cambrian lines in 1988. Similar in principle to Electric Token Block, RETB uses 'electronic' tokens issued to the driver by radio from a single control centre. The Dingwall to Kyle line was the first to use RETB, being 'launched' on 6 July 1984, and becoming fully operational from 28 October 1984. The Far North Line to Wick and Thurso was converted in November 1985. These routes were initially controlled from Dingwall, and it was intended that the Inverness resignalling scheme would included the Inverness - Dingwall section. However RETB was extended to Inverness with control moved to the new Inverness Signalling Centre in August 1988 (Inverness RETB). RETB was introduced on the WHL in three phases and is controlled by two work stations in Banavie Signal box, which also controls the Caledonian Canal swing bridge. RETB operation started firstly on the Mallaig section from 7 December 1987. Helensburgh Upper - Crianlarich - Oban was converted from 27 March 1988, and finally Crianlarich - Fort William Junction on 28 May 1988. Sixteen signal boxes were closed under the resignalling scheme. The Fort William area is controlled by conventional signalling from Fort William Junction signal box. Fort Willliam Jn was renamed from Mallaig Junction to avoid any confusion when using RETB. Similarly, Tyndrum Upper was changed to Upper Tyndrum to distinguish it from Tyndrum Lower on the Oban line. A list of Radio frequencies used on the West Highland Line can be found in the message archives. In 1984 Inverness depot had a dedicated fleet of eight steam heat Class 37/0 locos fitted for RETB working on the Kyle line. By 1986 Inverness had four 37/0s and eight ETH class 37/4s covering both Kyle and Far North lines. This fleet remained constant until 1989 when Class 156 units were introduced. From summer 1987 Eastfield's Class 37/4 fleet and 3 Class 20s were equiped with Radios and CDUs ready for the start of RETB operation. In January 1989 a dedicated fleet of Class 156 units took over the daytime WHL passenger services and these were also with radios and CDUs. From May 2000 Class 158s replaced 156s north of Inverness. The 158s have CDUs removed when working on other routes. Class 66 and Class 67 locos have now largely replaced the class 37s, and EWS (now DBS) created dedicated fleets permanently fitted with CDUs for working on RETB signalled routes. Other operators such as WCRC fit their locomotives with CDU's on an as required basis. Portable RETB equipment which combines a radio set and CDU in one case, is known as a Transportable Token Unit (TTU) and is now mostly used in Road/Rail vehicles for inspection and maintenance work. Each train has a Cab Display Unit (CDU) with a unique 4-digit number. Section Token : Authorises movement from the stopboard (or section signal) at the entrance of the section to the stopboard (or signal) at the next Token Exchange Point. Tokens may have a suffix to remind the driver to arrive in a siding or 'wrong direction' platform. For attaching moves at Crianlarich and Georgemas, a 'Loop Occupied' suffix is used. Long Section Token: Authorises movement from the stopboard (or section signal) at the entrance of the section to a stopboard (or signal) ahead, without the need to stop at Intermediate Token Exchange Points. 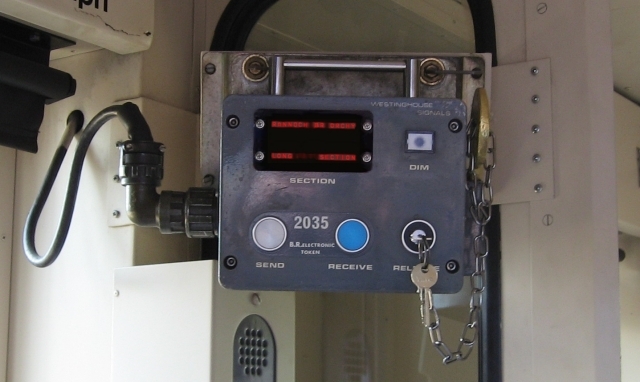 Shunt Token: Allows shunting movements to take place at at Token Exchange Point, within the Station Limits boards, and prevents other trains from approaching the TEP. Engineering Token: Allows track engineers to take possession of a Section between the Station Limits boards of two adjacent Token Exchange points. Test Token: Used for checking the Cab Display Units are working correctly. Since Autumn 2003, RETB lines have also been fitted with TPWS. This has resulted in blue lights (Lineside Status Indicators) being fitted to Stop Boards to prove the TPWS system is functioning correctly. LSI = Lineside Status Indicator, for TPWS. Created by Dysgraphyk and last modified by scot-rail admin at 09:01, 14 of September 2010.